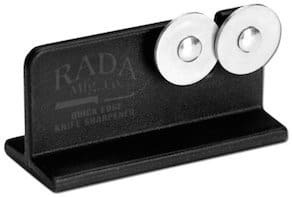 The Rada Quick Edge Knife Sharpener R119 is specifically designed for those that own Rada cutlery and wish to restore factory edge sharpness to their knives… or so the manufacturers would have us believe. However, if you have bought a range of knives from a certain brand, it often does make sense to purchase a knife sharpener from the same company. The convenience of knowing that the sharpener is completely compatible with your knives, and in same cases optimized to bring out the best results, makes it a very convenient option. Especially if more complicated whetstone sharpening, or more expensive electric sharpeners are not the way you wish to go. 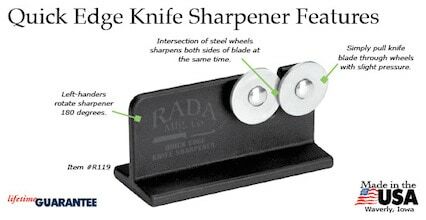 So how does the Rada Cutlery Quick Edge Knife Sharpener fare? For an affordable budget range knife sharpener you could certainly do worse. By no means is it ground-breaking in approach, (at its low price point you wouldn’t expect it to rewrite the rule book on knife sharpening), however you can expect a good finish when used on your Rada knives. The manual sharpener uses two hardened steel wheels that are set at the correct angle to sharpen Rada knives. It is also very simple to use, just pull back the knife blade several times between the wheels and sharpness is restored. And although the tool is meant for Rada kitchen knives, it can easily accommodate other types of kitchen knives as well as pocket-knives, and certain hunting knives. Overall, you will not go wrong with the Rada Cutery Quick Edge, especially if you have a set of Rada knives slotted away in your kitchen. Comes highly recommended. A good reason to get behind the Rada company is the fact the company is 100% American owned, with all products being 100% America Made. They are also a new wave company dedicated to efficiency and eco-awareness. The company strives to reduce its imprint and minimize waste at every stage of the manufacturing process, from product creation, packaging, order-processing and shipping. Located in Waverly, Iowa it is a home-grown company that has fully established itself on the American market since it began back in 1948.